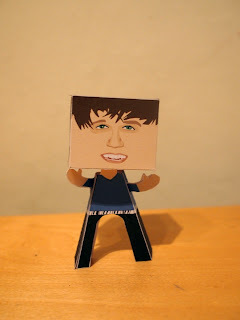 This paper people is Bo Burnham, the papercraft is designed by sally. Robert “Bo” Burnham is an American comedian, singer-songwriter, musician, actor, and Internet celebrity. Writing comedic and satirical songs with a politically incorrect slant, he achieved fame when his YouTube videos took off and received more than 70 million views by October 2010. Comedy Central Records released his first EP and his first two full-length albums. On January 29, 2011, it was announced that Burnham finished #1 overall in voting in 2011′s Comedy Central Stand-up Showdown.